TAKE a Mad Max-style rebooted game show, hosted by former international cricketer and all-round good guy Freddie Flintoff. Add MC Lethal Bizzle to the mix. Then, ensure Capital FM presenter Vick Hope is on hand to help dilute the testosterone. What do you get? Carnage. The concept of the show is simple. Hope calls it a mix of Robot Wars, Mad Max and Wacky Races. Certainly, the design is inspired by George Miller’s crazed film franchise, and Bizzle and Hope look the part. The influence of the Wacky Races is harder to spot, though this is a competition in which teams — each comprising a driver, an engineer and a mechanic — battle it out in a South African desert landscape, north of Cape Town, where the temperatures can hit mid-40C. There are three settings: the grid, the scrapyard, and the dome. And, just to make it interesting, there are rampaging monster mutant trucks bent on mangling any vehicle which gets in their way. There are walls of fire too, and the basic idea is to smash the other team’s vehicle until they can’t be driven. 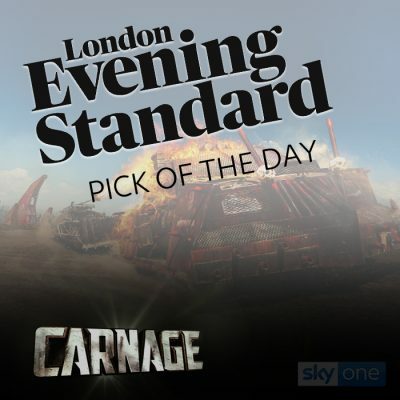 A post-apocalyptic demolition derby in dragged-up dodgems? Why not?